Remember way back to last week when I wanted a card so badly, but I didn't say which card it was. You know that feeling. You see a card on eBay or on someone's blog and you think to yourself, "Man, I just have to have it. Just gotta get it." That's how many story begins. I was looking around eBay late last week and all the new baseball cards I wasn't going to get my hands on. I thought about all the ways my money should be spent until I stumbled upon the card. This isn't a white elephant type of card. It was just a card I wanted to put into my collection and stare at for a little while. So, I bid on the first card. I bid on the second card I saw. I do have limits. And even though I wanted this card, I wasn't going to go crazy. But on the third attempt, I thought to myself that if this doesn't work I'll probably give up because the card will be out of my price range. So, I bid. Left the computer and tried not to think about it. This brightened my mood a bit. I was disappointed that I was too late in getting Derek Jeter in Mario's directory. This helped heal the mood. That's a great looking card i must say!! The vintage jersey bits look really nice. The three we have that we like the best are Johnny Mize, Orlando Cepeda, and if you can call this vintage, a stripey Tom Seaver. 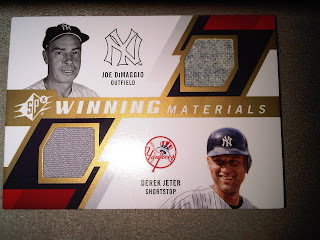 That is a sweet Joe D.
Holy Jeebus, that's a very nice card. Smart move just putting in your bid and walking away from the computer. I'm convinced that eBay gremlins know if you're desperately watching an item and will snipe you at the last second solely out of spite. If only the swatches matched the pictures. It's still a really nice card. Congrats! It is a nice feeling when you win a card you really want without having to go crazy.